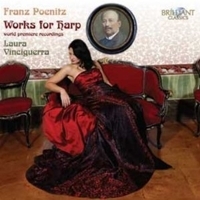 This is the first volume in a series of Poenitz recordings on Brilliant Classics performed by Laura Vinciguerra and contains several works receiving their premiere recordings as well as a touching tribute by Alfred Holy (1866-1948) one of his colleagues in the Royal Court Opera in Berlin - a company Poenitz had been a member of for nearly fifty years. Franz Poenitz (1850-1912) was born Franz von Burkowitz. When he was two years old, his mother died in her third childbirth. Her sister took him with his sister to Berlin, where her husband the violonist Heinrich Poenitz quickly recognised Franz' talent. First he taught him violin, but from 1855 on he played the harp. He went on to become one of the most important virtuoses and composers for the harp. For to honour what his foster father had done for him he took his name as his stage name. In 1876 he became one of the first 'Bayreuth Seven', the group of harpists at the new Festspielhaus built to perform the works of Wagner in. He was a man of wide interests, skiing, hunting, angling and painting. He died in Berlin of complications following an appendectomy. This CD contains several works receiving their premiere recordings as well as a touching tribute by Alfred Holy (1866-1948) one of his colleagues in the Royal Court Opera in Berlin - a company Poenitz had been a member of for nearly fifty years.